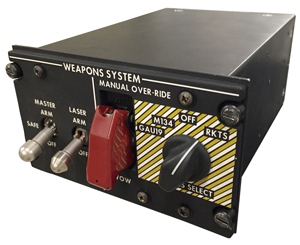 The AMETEK Weapons System Process Panel (WSPP) provides the control interface from the cockpit to the weapons systems. Using our expertise to interface with various signals, weapons systems can be retrofitted in any type of aircraft without adding complexity. The units do not take significant space and can be installed in tight quarters as there is limited space on the aircraft control panel console for mounting weapons control systems. The weapons system processor panel implements safety interlocks to prevent or enable firing of the aircraft weapon. Weapons control system includes a data concentrator unit that conditions outputs for display on a multifunction display (MFD) that is presented to the pilot, and copilot if present. The weapons system processor panel also provides data for a weapons bus controller to implement firing of weapons.